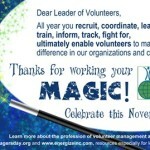 November 5th is International Volunteer Managers Day (IVMDay). Although still not widely known, IVMDay has grown remarkably since it was started by one American back in 1999. The international steering committee, chaired by Australian colleague, Andy Fryar, has worked hard to build an attractive and useful Web site and to encourage a wide array of organizations to sign on to its mission. Check out the many planned activities already posted, as well as the free posters, banners and thank-you notes you can download to pass the celebration forward. The illustration below is the ready-to-send card Energize has contributed to the festivities. It is important to let those professionals know that the spirit of volunteerism is enhanced and enabled by them – and to thank them…Just as important is the opportunity to educate others about this important work, which is why we encourage the catch phrase “Education through Celebration” when we acknowledge IVMDay each year. Most professions do not expect or need a special day of recognition – why do we? Because we are still largely invisible to everyone except the volunteers we lead. I personally do not think of IVMDay as a “holiday” and, while recognition of my colleagues is well deserved, hope that someday it will no longer be necessary to make a big deal out of November 5. To me, IVMDay is indeed education through celebration – an opportunity (or an excuse, if you will) to get others to pay attention to what it takes to coordinate volunteers effectively. Regular readers of these Hot Topics know that one of my recurring themes is getting executive or senior management to understand the incredible potential of volunteers and then, by extension, the importance of placing a great staff member into the volunteer resources manager (VRM) position. We all continue to tilt at this windmill and IVMDay gives us a chance to highlight the issues, with the backup of an international movement. IVMDay is also a good time to advocate for volunteer management as a legitimate subject in the curricula of relevant professional academic degrees. Only a tiny percentage of universities offer a few hours of teaching about volunteers, let alone an entire course. Here’s a great (or sad) example. A few miles away from my office sits the University of Pennsylvania, which just announced a brand new “Masters of Science in Nonprofit Leadership” program. A search on its long core program Web page produces 0 results for the word “volunteer” (although there is one reference to “paid and unpaid” labor), 2 results for the word “board” (under governance and not modified by the terms volunteer or unpaid), but 6 mentions of “funds” or “fundraising.” Yet another source of highly educated executives, credentialed by an Ivy League school, unaware of what they do not know about a set of supporters vital to their organizations – or the skills needed to engage them. The vast majority of people who have been designated as VRMs neither see themselves nor want to be part of the profession of volunteer management. Working with volunteers is only one part of their job, added on to a long list of other, more valued, responsibilities. Ask these folks what their job (or profession) is, and you’ll hear social worker, probation officer, activities director, teacher, curator, park ranger – certainly not “volunteer resources manager.” How does anyone, therefore, identify or even count the full range of people in our field? Even colleagues in full-time VRM positions do not necessarily feel committed to volunteer management for the long term, as a career. It is often seen as a stepping stone to other, more desired, and more high-level jobs. Huge numbers of people whose daily work centers on effective volunteer engagement never see their connection to a field of volunteer leadership. This includes clergy of all faiths, institutional chaplains, political campaign managers, youth sports organizers, alumni association staff, most fundraisers, and more. Volunteering is so much larger than the activities of volunteer-involving organizations. While there are thousands of all-volunteer associations active in communities around the world, rarely do we (paid VRMs) reach out to the presidents and officers of these groups, even though they must be skilled at most of the volunteer management functions we perform in agencies. Conversely, volunteers who lead other volunteers are frequently the least aware of training and resources that could help them be successful in their voluntary role. Might IVMDay be an occasion to identify, find, and invite all of our colleagues to come together? I put this challenge to all DOVIAs and other professional networks of VRMs, and to volunteer centers and all peak bodies in the volunteer field. How can anyone else give us recognition when we can’t even communicate together? Does your title reflect your connection to volunteerism? Should it? Can you suggest/ask your organization for a clearer title? Are you active in a local network of VRMs? (Not sure if there is one? Try the list at http://www.energizeinc.com/prof/dovia.html.) Should you invite a few colleagues to lunch and start one? Send a thank-you note to any one you know who works with volunteers, whether or not they self-identify as being “in” volunteer management. Remember you can use the IVMDay resources. Write a pointed note to any college or university (like the University of Pennsylvania above) that offers a degree or certificate in nonprofit management, public administration, arts management, or any other program that should teach about volunteer involvement but does not. Now, what are your ideas for what one person can do to celebrate IVMDay? And thank YOU for all you do, every day, to support volunteers in giving their best service to so many different causes and missions. You make it look like magic! This is an interesting topic and perhaps the reasons we have not be jumping in with responses are as varied as the organizations for which we work. So education on all levels becomes an issue. While I would like educated, skilled volunteers doing creative tasks and working with our directors and managers I know that this may be a one office at a time task. I also know that I cannot do it without the assistance of my supervisor to open some doors, and then I need just the right volunteer. Susan, continue to remind us to shoot for the stars, I like to put these things into my annual plan so that it is in front of me on a regular basis. Perhaps if we talk about it often enough the silence would not be so deafening. This is a timely topic. As I sat in a manager/supervisor's meeting last week and listened to our CEO and executive team talk about our future direction, I realized we have to realign our recruitment efforts once again. Although we have a board and a junior board and a few other volunteers with specific high level skill sets, we can do a better job starting with analyzing needs for talent at the executive levels which we have not done effectively. I don't know that it's a matter of our executive team not being willing to work with volunteers as much as it is that we have not demonstrated the value by designing positions that will make an impact for them. Our CEO asked us to let her know our thoughts. I will address this with her and thank you for initiating this topic.